In a series of provocative moves that seem designed to threaten war, Russia continues to modernize its military, increase military production capacity, build new atomic bunkers and conduct large-scale military drills. Russia's recent invasion of Crimea, which went largely unanswered from the United States and the rest of Europe, must be seen as a stark warning of what is to come. For neighboring countries such as Estonia, Latvia and Lithuania, a resurgent Russia building and flexing its military muscle is a grave threat as Putin gradually works to expand Russia's sphere of power. Though defensive weapons such as fortifications or missile shields are normally non-provocative, in the context of the strategic doctrine of mutually assured destruction (MAD) they imply that the country possessing them intends to safeguard itself while retaining the ability to wipe out its enemies, thus destroying the delicate balance of MAD. It is in this context that Western experts now view Russia's construction over the past several years of numerous atomic bunkers near Moscow and elsewhere around the country. US intelligence officials refer to dozens of construction projects with one of the largest facilities a vast nuclear command and control bunker still under construction in the Ural Mountains. The bunker, which spans some 400 square miles, would be capable of coordinating war efforts far from population centers under Mount Yamantau in the remote wastelands of the Ural Mountains. Also of note is the new command and control center a mile and a half from the Kremlin, Russia's answer to the Pentagon, that was recently completed and which was shown directing the air campaign in Syria. In addition to hardening dozens of vast bunkers against nuclear and conventional attacks, Russia is also expanding and modernizing its offensive nuclear arsenal and implementing changes to its nuclear use doctrine. Army General Curtis Scaparrotti, in charge of US European Command, has called Russia's new doctrine on tactical nuclear use "alarming". He went on to say in a recent press conference, "It is clear that Russia is modernizing its strategic forces". In addition to modernizing an aging nuclear arsenal, the doctrine calls for the use of tactical nuclear weapons, that is to say short range and low yield nuclear warheads, in response to conventional conflict. 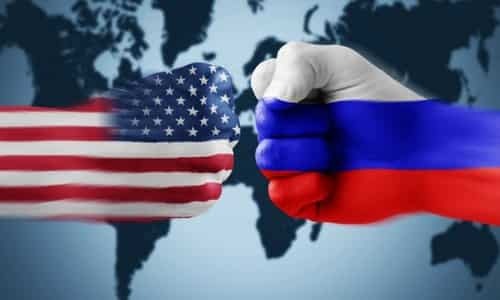 According to US State Department figures released in March, 2016, Russia added 150 new warheads to its arsenal in the past year while the US shrank its stockpile by 57. Russia is not merely building from past designs either. Recently leaked plans show submarine drones capable of launching nuclear missiles. Also, a reported new stealth nuclear missile and warhead, called Satan-2, is designed to evade radar detection systems. Both hint at Russia's intent to bolster its strategic nuclear power. The combination of tactical and strategic nuclear assets is a strong deterrent for NATO that might seek to intervene in the next invasion, perhaps of Estonia or Lithuania, as Russia continues its expansion under the now wildly popular Vladimir Putin. Numerous extremely large scale military drills that simulate invasions of Eastern Europe have become routine. The creation of a NATO Rapid Response Force of several thousand mechanized soldiers to defend Lithuania and Estonia was met with the Russian deployment of several divisions, more than 35,000 troops, in addition to those already taking part in large combined arms drills. Now Russia has begun conducting "snap" drills without prior warning. NATO Deputy Secretary-General Alexander Vershbow stated that these large drills without notification number about a dozen over the past two years. The numerous Russian military actions point to a desire not only to strengthen its position in the event of war but also to drill for potential invasion as a way of threatening and warning off opposition to Russian aims. According to experts, this needs to be viewed from both an international and a domestic standpoint. Internationally, Russia is poised to continue seizing territory whenever it can, as it has done in Georgia and Ukraine, and influencing political outcomes when military force is less appropriate. Domestically, the show of force has given the Russian people a country of strength again. Putin's approval rating is said to top 80% now, even after the recent financial crisis. In a wave of national fervor, even in times of economic hardship, Russia has fallen back on its Cold War image of strength to consolidate the government's position at home as well as abroad. The open question is how far Putin will decide to beat the drums of war and test the limits of Western patience before a major conflict breaks out? In this dangerous game of politics, the next invasion may come sooner rather than later.